Kern County banned commercial cannabis Tuesday. Four of the five county supervisors said they did not want to be party to the permitting and regulation of an industry that wields such a destructive impact on the communities they represent. “The vast majority of the pot shops in the greater Bakersfield area are in Oildale,” said Supervisor Mike Maggard. He said his people, the residents and businesses in the poorest areas of his district, are being disproportionately impacted by marijuana dispensaries. Maggard said suggesting that he allow an industry that has victimized his constituents for years to operate legally, simply for the money it might represent to county coffers, is offensive to him. “I can’t turn my back on the neighborhoods I represent,” he said. When it comes to water and agriculture, California is upside-down. That’s what historian Carey McWilliams wrote in his 1949 book, “California: The Great Exception.” Most of the water is in the northern part, and most of the best land for farming is further south. That assumes you agree that abundant food production is a good thing, a view that in recent years has become unfashionable in places like Venezuela, Zimbabwe and San Francisco. That plan was moved forward when the Central Valley Project Improvement Act was passed by Congress in 1992. Under the law, 260 billion gallons of water on the Valley’s west side had to be diverted away from human uses and out to the environment. Then a series of lawsuits under the Endangered Species Act secured protected status for smelt in 2008 and salmon in 2009, and that was enough to force the virtual shutdown of two major pumping stations that moved water to the Central Valley. Another lawsuit resulted in the San Joaquin River Settlement, later enacted by Congress at a cost of more than $1 billion to taxpayers, which diverted more water away from the Central Valley in an attempt to create salmon runs. Farmers struggled to get by with groundwater, but in 2014, new California regulations limited that, too. In 1949, McWilliams observed that if the Central Valley were a state, it would rank fifth in the nation for agricultural production. Today it has poverty and unemployment rates that would be right at home in the Great Depression. And that’s why members of Congress from the region have repeatedly introduced legislation to adjust federal law in ways that would allow water to be restored to the Central Valley. The legislation passed the House several times only to die in the Senate. Click here to read the full story from the Daily News. Gov. Jerry Brown is cracking down on how much water Californian’s use in their daily lives, and that means parched lawns are turning brown as the state heads into its fourth year of drought. In steps some savvy entrepreneurs who have a solution to water restrictions: spray paint your lawn green, don’t waste water on it. Lawn painting companies, like Xtreme Green Grass, are seeing business boom. “I probably have about seven appointments scheduled in just the next week or so.” David Bartlett, the company’s owner, told KXTV-Sacramento. Bartlett’s company sprays a non-toxic green dye across the brown areas of your yard, making look as if it’s been freshly watered. The service takes about an hour and costs 25 cents per square foot. That may seem like a lot, but Bartlett says it’s way cheaper than making your lawn “drought-friendly” by bringing in new plant material. Doing that can cost homeowners several thousand dollars. Most of California is going through an “exceptional” drought period, according to monitors, and some 37 million residents are being impacted by less-than-normal rainfall and snowpack. The Golden State saw record low snowpack this year. In response, Gov. Brown mandated that statewide water use shrink by 25 percent, pushing for fines up to $10,000 for those who use too much water. Republicans have blamed federal and state policymakers for flushing lots of water out to sea every year because of the delta smelt — a small, endangered fish. 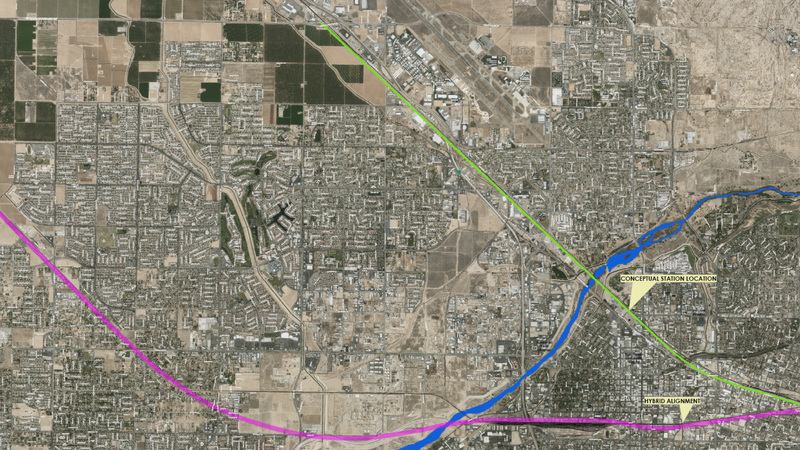 The above map (bigger version here) shows the change in the route in Bakersfield, from the purple line to the green line. In exchange for dropping the case, the CHSRA reopened the study of a new alignment that will be less damaging to the city of Bakersfield and will promote more public engagement. In essence, the settlement reopens a previously project-level environmental impact report and study the CHSRA board certified on May 7. Under the settlement, the CHSRA has the right to continue with the original train route. But Bakersfield retains the right to sue again if the same damaging route ultimately is selected. Agree not to exclusively rely on its prior certification of the hybrid alignment to approve the ultimate alignment and station location in the city. As CalWatchdog.com reported last week, “the U.S. Surface Transportation Board ruled in favor of the CHSRA in a dispute over whether the STB’s authority to green-light the project takes precedence over the California Environmental Quality Act.” The CHSRA wanted, and got, construction stoppage off the table as a CEQA remedy – at least for now, pending actions in the other lawsuits. So the STB ruling certainly was part of the legal atmosphere surrounding the last days of negotiations. Bakersfield also agreed it will not file a National Environmental Quality Act lawsuit or challenge funding prior to the study of the alternate alignment. 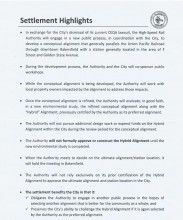 In sum, Bakersfield gains a couple of things from the agreement. It gets a breather from the controversy that will follow the STB decision. It gains a fresh look at a less damaging rail alignment. And in engages its local community, while retaining the right to file another lawsuit if it doesn’t like the final outcome. The CHSRA gets one of seven lawsuits off the train table. This articles was originally published at CalWatchdog.com.